Many people have teeth which are crooked or crowded. Orthodontics is the straightening and realignment of teeth to correct these irregularities. This aims to enhance their appearance and create a sense of aesthetic harmony. Believe it or not your teeth are always moving, albeit minutely. Clearstep exerts gentle pressure upon the tooth/teeth in the direction in which you'd like them to move. 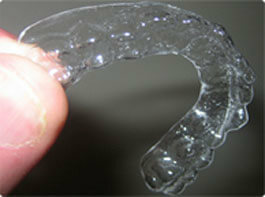 Are the PerfectClear K Positioners comfortable? As the K positioners have no metal wires and brackets, they are comfortable, better still because they can be removed (by you - the patient), eating, brushing and flossing are not problematic. Will my speech be affected by wearing the PerfectClear K positioners? As with many orthodontic treatments, K positioners may temporarily affect your speech, and you may have slight lisp for a day or two. However, as your tongue adjusts to the presence of the K positioners, any lisp or minor speech impediment caused by the device should disappear, usually fairly early on in the treatment. Orthodontic dentists in Hertfordprovides invisible dental braces, invisalign tooth braces and clear teeth braces to improve your smile.